Lugarti's Mercury Vapor Bulb is a self-ballasted flood light that produces UVA, UVB and Heat all in one bulb. It's UVB output is similar to natural sunlight and outlasts all other Mercury Vapor bulbs on the market! One of the most critical factors in caring for reptiles in captivity is providing them with proper heating and lighting. UVA light promotes basking and feeding behavior, stimulates healthy activity levels and boosts reproduction. 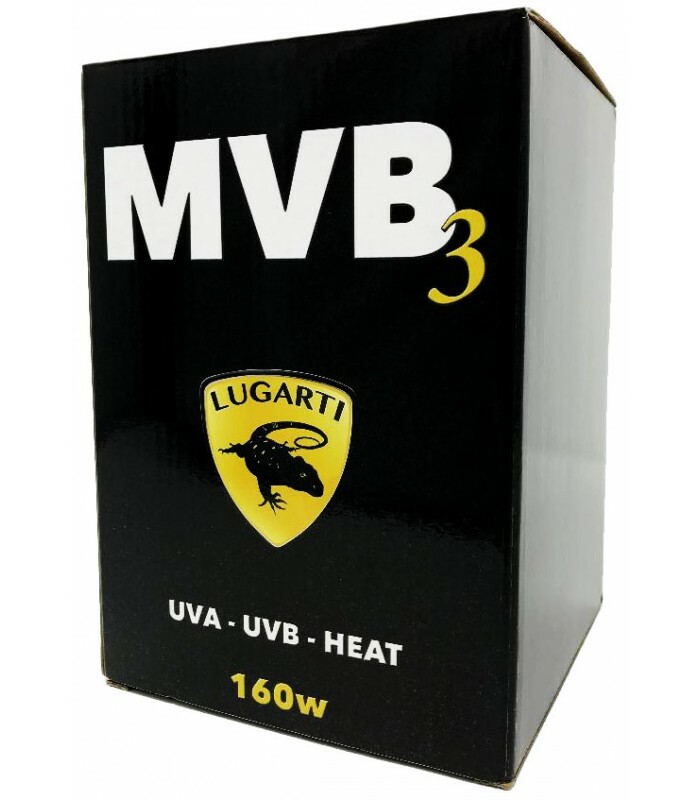 UVB light regulates the synthesis of Vitamin D3 in reptiles’ skin and allows them to properly absorb and metabolize calcium, ensuring healthy bones and normal muscle function. Heat is required for proper digestion, excretion of waste, metabolism and circulation. Without vitamin D3 and calcium, reptiles may develop hypocalcemia (twitching and muscle spasms) as well as metabolic bone disease (MBD). Lugarti’s MVB3 is a self-ballasted mercury vapor bulb designed to provide reptiles that spend many hours a day exposed to high levels of sunshine with beneficial UVA, UVB and Heat, all in one bulb. 100w - MINIMUM Distance of 12" produces 150-200 microwatts per square centimeter (uW/cm2) of UVB and 900-1200uW/cm2 of UVA. 100w - MAXIMUM Distance of 20" produces 50-75 microwatts per square centimeter (uW/cm2) of UVB. 160w - MINIMUM Distance of 18" produces 150-200 microwatts per square centimeter (uW/cm2) of UVB and 900-1200uW/cm2 of UVA. 160w - MAXIMUM Distance of 24" produces 50-75 microwatts per square centimeter (uW/cm2) of UVB. IMPORTANT: Bulb should be tested for UVB output every six months and replaced every twelve months. 100w should not be used with enclosures smaller than 40 gallon (18” minimum height). 160w should not be used with enclosures smaller than 60 gallon (18” minimum height).